Although summer vacation is over, kids are in school, and in many parts of the country the leaves are starting their magnificent display of red, orange, and yellow, great, coast-to-coast horse racing continues. As the seasons change, so do the horse racing venues. We go from summer's Saratoga and Del Mar to fall's Belmont Park and Santa Anita Race Track. The MISS GRILLO STAKES have been around since 1991, named after a horse called, you guessed it, MISS GRILLO. It's a 1 1/16th on the inner turf for two-year-old fillies. Trainer, Chad Brown has won the last two and five of the last six. It certainly looks as if he knows what it takes to win the MISS GRILLO. This year he brings NEWSPAPEROFRECORD (PP: 6 ML 6/5) and DOGTAG (PP: ML 5-1) to the starters gate. Hm, perhaps our handicapper was aware of Mr. Brown's success as this is our Pro Subscriber's bonus commentary, "NEWSPAPEROFRECORD could be lone speed, run comfortable early fractions, and then race to the wire first. DOGTAG might run in the shadow of our top pick. The pair could race one, two from the gun to photo. STELLAR AGENT raced to an easy maiden win in his debut. His trainer, Jose Abreu, wins at 33% in races after maiden win. MISS TECHNICALITY is two-for-two on the turf and one-for-one at Belmont." Teleporting via keyboard from New York to Southern California, we make our way to the ZENYATTA STAKES, which obviously gets its moniker from the great race horse ZENYATTA. 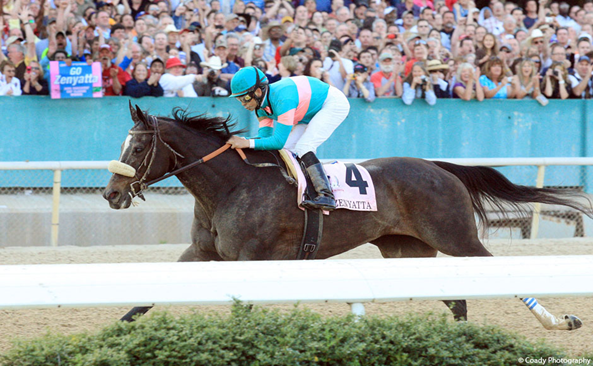 The race became officially the ZENYATTA in 2012, replacing or renaming the Lady's Secret Stakes. Much like the MISS GRILLO, this race has been owned by a single trainer, Richard Mandella. He's won four of the last five. A new trainer will get the mantle this year as Mandella doesn't bring any entrants to the 1 1/16th dirt race. In the previous Santa Anita meet, from December 2017 until June 2018, in 55 races of 1 1/16th mile on the dirt, one out of three was won in wire-to-wire fashion. Again, our house handicapper appears to be on the BIAS in his analysis, coincidence? Here is what he shared with our subscribers. "It's a short field with a horse that has past performances that dwarf the rest of the field. As much as we'd like to put another ahead of ABEL TASMAN, we just can't do it. Maybe, VALE DORI can get a big enough early lead that ABEL runs out of room trying to chase him down, wire-to-wire is his best chance. LA FORCE is making his first start since late July. He doesn't like to win, but sure seems to like second, finishing in the place spot five-of-nine on fast dirt. SHENANDOAH QUEEN just looks better than the other two left in the field." Winding up the day's graded stakes racing brings us to the JOHN HENRY TURF CHAMPIONSHIP. Seven boys, three-years-old and up are going to get after each other at 1 � miles on the grass. It's one of the final prep races leading to the Breeders' Cup Turf. Length, surface and experience says that closing is like to be the running style of choice. However, we believe it is possible that pace could be the determining factor for the winner, not the best horse. According to our analysis,"ANN ARBOR EDDIE has a chance to run by himself on the lead, set a comfortable pace, and have enough left to bring it home. FASHION BUSINESS has the best recent speed numbers, but likes to come from the back, back of the pack. We just don't see a lot of pace early on, which could make it difficult for him. ASHLEYLUVSSUGAR, ah, don't we all? SUGAR is the other entrant that might decide to make an early move and see if he can outlast the late rush. LIAM THE CHARMER might be in competition with FASHION BUSINESS for last place out of the gate. Both will be charging for the wire late. Again, pace is likely to work against the closers." GET OUR FULL CARD BELMONT AND SANTA ANITA PICKS!